On Tuesday October 2nd, 2012 while responding as part of a Horse Patrol unit from Naco Border Patrol Station to a sensor activation, close to Highway 80 just West of Douglas Arizona, which indicated a possible narcotics load up occurring, Border Patrol Agent Nicholas Ivie was shot and killed in the line of duty. Another Border Patrol Agent was wounded. The subjects, not yet determined to be either a bandit group intending on robbing illegal aliens, or simply a armed narcotics smuggling group, have not yet been captured, or, suspects detained in the general area have not yet been linked to the shooting. Update: Since posting this article, a preliminary FBI investigation has now reported that in all probability Agent Ivie was killed as a result of friendly fire. Imagine several agents responding to a remote area in the dead of night, expecting to find a narcotics load or a bandit crew, and you can start to see what kind of situation this is. The results of the investigation do not make Agent Ivie's sacrifice any less. 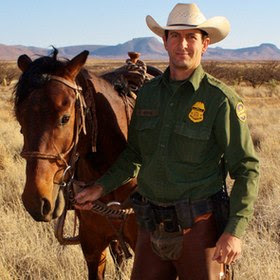 Border Patrol Agent Ivie is the second Border Patrol Agent to die in the line of duty in the last two years from armed criminals operating inside the border in very rough and remote areas of Arizona. Nicholas Ivie left a wife and two young children. We wish speed in God granting Agent Ivie's family a measure of peace from their grief. Please keep our Border Patrol Agents, especially those on horseback, as well as our other dedicated law enforcement officers in your thoughts and prayers. Few folks know that many who "stand the wall", do so on horseback. What a shame this young agent paid the ultimate price for his dedication. My heart goes out to the Ivey family, and to the other officers on the scene who will now have to live with the question of what actually happened, and why. Yearling's Swelling Caused by Protein Deficiency?